An accumulator is a pressure storage vessel in which an incompressible pressurized fluid (such as oil) is kept so it can be deployed as it is needed. There are various options for storing the energy in an accumulator. Pressure can be stored using a spring, air bladder or piston, and each is used to keep the fluid pressurized while in the accumulator. Because of the way they function, some hydraulic systems require a ready supply of energy, which takes the form of pressurized fluid. But, this pressure does not always have to be continuously supplied. When the right accumulator is used the entire hydraulic system can operate safely, and will give you years of consistent service. While the scope of application may differ, the essential function of hydraulic accumulators is largely standard. They can be deployed in all manners of industries including, aviation, power generation, rail vehicles, oil and gas exploration, construction equipment, plastic molding, machine tools, automobiles and much more. In some applications, considerable power is required for limited periods of time, or even intermittently. The pressure pumps cannot be expected to run continuously, that would be a waste of energy and will wear the pumps unnecessarily. This is where using an accumulator would make the most sense. Instead of the pump running continuously, is only employed when the accumulator pressure needs replenishing. In larger industrial operations, a confusing maze of piping and valves have to operate simultaneously. But it is just not possible to manually control all these valves. To ensure remote operation, plant engineers connect accumulators onto the hydraulic system to provide a pressure reservoir so that pumps do not run continuously. Hydraulic systems can only work well if there is a consistent supply of pressure. As soon as the pressure is cut, due to pump failure or other causes, the whole system and others that feed off it are affected. A secondary source of energy thus becomes important. An accumulator can alleviate this issue. Accumulators are also handy when the hydraulic system requires more pressure than the pump can supply. An insufficient supply of energy will have tremendous consequences for product quality and the safety of people and the equipment itself. After a pump failure, an accumulator can keep the hydraulic system adequately pressurized while the pump is brought back online, or the system itself is safely shut down. This helps plant operators maintain pressure at levels required for the optimal operation of the hydraulic system. There is a slew of emergencies for which accumulator stored fluid pressure can prove indispensable, such as power outages. The accumulator will hold pressurized fluid, ready to be called upon in the event of an emergency. The only requirement for accumulators when used this way is they must have a capacity exceeding what the hydraulic system itself requires. This ensures that pressure does not drop below the minimum required for the operation of the system. The great advantage of using accumulators is a smaller pump can be used where the hydraulic system requires more pressure than a small pump can consistently supply. Because there is a pressure reserve already available in the accumulator, lesser demand from the pump is created and you will save money from the accumulator eliminating the need for a larger capacity pump. Therefore, there will not be a need for a continuous supply of pressure directly from the pump, which then negates the need for a larger pump. This unlocks lots of cost savings as lesser energy is used to run the smaller pump. A smaller pump is also cheaper to procure and to maintain. There are applications where the hydraulic system must run continuously, without any breaks. A drop in pressure will cause problems on the plant, resulting in many safety issues, or even the production of defective products. Here, a hydraulic accumulator is used to compensate for any pressure drop that may cause shocks on the system. Similar to the shocks in your car absorbing and releasing the energy from a pot hole or speed bump, an accumulator provides that type of stability in a hydraulic system. It helps keep the output pressure consistent and relives internal wear and tear. Abrupt pressure drops have potential to cause damage to these systems. But pressure spikes can be just as damaging too. An accumulator can, in this instance, absorb this excess pressure to stop it causing any damage to the hydraulic system. A hydraulic accumulator has a sealed cylindrical chamber with a fluid inlet and an outlet port. Inside, is a mechanism (spring, air bladder or piston) that will keep the fluid under pressure. The piston can take the form of a ram that is either weighted or spring loaded. Or there may be a gas-filled rubber bladder in place of the piston. When empty, the piston will sit right on the bottom of the chamber. Fluid is pumped at high pressure into this chamber, through the inlet, from an external pump. In order to push the piston up, and pump fluid into the accumulator, the pump pressure must exceed that of the piston inside the chamber. The outlet port channels the pressure from the accumulator to the machine or the tool it’s intended to energize. As long as the machine needs the pressure, the accumulator’s outlet port remains open and the cycle continues. But, as soon as the machine stops, the outlet closes and pressure will build up in the accumulator until its full capacity is filled. The accumulated pressure will then be saved for when it may be needed again. At this point the pump stops automatically or is stopped manually, only to start when the machine starts again and the pressure in the accumulator falls. There are several types of hydraulic accumulators, whose selection is determined by the intended application as well as the complexity of the hydraulic system. This is an old style type of accumulator which is no longer popular today. But you can still find some that are in use still. With these, there is a cylindrical fluid storage container that is filled halfway with oil, and the other half with gas, without a barrier separating them. To ensure that pressure does not escape, an operator will have to close the shut valve at the discharge end of the accumulator before the pump is shut off. This accumulator is only sustainable in smaller operations where manual controls will not significantly slow the hydraulic process and render it unfeasible. 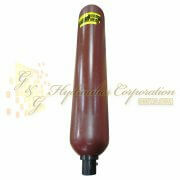 For this type, a rubber bladder is used to separate the nitrogen gas from the oil. To prevent loss of pressure during pump unloading, this accumulator uses a poppet valve that stops the rubber bladder from escaping. Fluid pumped into the accumulator will compress the pre-charged gas sitting above it, creating the pressure storage. As the pressure is fed into the hydraulic system for use, the pressure on the gas bladder subsides and the gas expands back to its pre-compressed shape. And so the cycle begins again. The more modern designs of these pumps now spot a mechanism that allows repair from the top, and not from the bottom, as was the case with the earlier models. Bladder accumulators are loved for their versatility and cost effectiveness. The design for this accumulator is essentially the same as bladder charged accumulators. The difference is, in place of a gas bladder, a spring is used to keep the piston against the fluid and keep it pressurized. As the pressure is charged into the accumulator, back-pressure is created against the spring. This allows the fluid to keep its pressure. The pump will force more fluid into the cylinder to replenish the discharged pressure and the cycle continues. A benefit of this accumulator is there are no worries about gas leakages as it does not use any. These accumulators are suited for applications of high-pressure ratios and flow rates, where large volumes of oil are handled, and where a piston sensor is necessary for monitoring fluid volume. With this type of accumulator, a measured weight is used to keep the fluid in the accumulator adequately pressurized. These weights will keep a constant force on the fluid until the ram touches the bottom of the accumulator. Because of this, all the fluid will keep its pressure until the accumulator is empty. While these accumulators will give you a large pressure reservoir, a disadvantage is their considerably large size. They thus take up a lot of space and are quite heavy. If you have space for them, these beasts will serve you well. Just remember, they will also take longer to fill. If your application does not require a large pressure reservoir, you may consider using a diaphragm accumulator. This type has a relatively small fluid storage and uses a diaphragm to separate the gas from the oil. It has a poppet valve that is molded to the bottom of the accumulator to prevent it from extruding through the fluid port. The diaphragm absorbs the pressure of the fluid as it is pumped into the accumulator. But it will still have enough thrust to discharge the pressure at a constant rate when the hydraulic system has a need for pressure. Diaphragm accumulators are suitable for applications where weight and space is a factor, the budget is limited, and where small volumes of pressure are required. They have flexible mounting positions and are great for fluids with low lubricity like water. There are other less common accumulators that are mostly employed in special applications. These include pulsation dampeners, which are used with hydraulic systems where there are considerable pressure fluctuations, and metal bellows accumulators used in fuel injection systems for diesel engines, marine, and select industrial applications. Hydraulic accumulators will fail at some stage. And the mode of the failure can have a profound effect on the operation it has to supply pressure to. A sudden accumulator failure is desirable in some operations, while a gradual failure may be acceptable in others. For example, with high-speed machinery for which the quality of products is directly affected by the efficiency of the hydraulic system, a sudden failure of the accumulator is less damaging. It allows for the malfunction to be picked immediately, which prevents the production of defective products. On the other hand, a slow, gradual failure of the accumulator will be preferable for where continuous pressure must be maintained. An example is braking systems where sudden failure will cause serious risks in mobile equipment. A piston loaded accumulator will be ideal for the 1st application, while a diaphragm or bladder accumulator would suit the latter application. Perhaps the first consideration you should pay attention to when you go shopping for an accumulator is the maximum volume of pressure the hydraulic system itself needs. This determines the minimum capacity of the accumulator you should procure. There is no point choosing an accumulator whose maximum capacity is not enough to provide the hydraulic system with the power it needs. Generally, piston accumulators have a higher output proportional to their designed capacity. The benefit is you can use these accumulators where you would not have space for a larger accumulator. Also, piston accumulators are available with a wider choice of lengths and diameters for each accumulator capacity. Diaphragm and bladder accumulators, on the other hand, have only one size per accumulator capacity and are available in only a few sizes. To avoid piston damage, piston velocity should not exceed a certain threshold. And fluid flow itself is limited by piston velocity. You will want to know if your particular application is high speed or low speed, as different accumulators cope differently with hydraulic system conditions. For example, when piston accumulators are deployed in high-speed applications, rapid nitrogen gas decompression will force the gas into the seal, damaging it in the process. Once the seal fails you pretty much have a dysfunctional accumulator. The type of fluid your accumulator will handle under pressure will also determine what accumulator is best for your needs. There is also the risk of fluid contamination to consider. This risk is more a concern for fluid contaminants acting on the seals in piston accumulators than with bladder type accumulators. Just as well, bladder accumulators are preferred for water service applications where there is a greater risk of pistons corroding if piston accumulators were used. However, both bladder and piston accumulators do require some level of preparation to protect them from corrosion when used for water service applications. There are several other factors that affect accumulator selection. These include external forces on the accumulator, safety considerations, the position the accumulator will be mounted on (horizontal mounting may cause faster bladder wear), and accumulator cycling frequencies. Any device that moves or stores a pressurized medium or energy has a level of danger attached to it. If not handled safely, such devices can cause a fire risk, mechanical damage to equipment, and injury to operations and maintenance personnel. Special care must always be observed when handling accumulators. When the pump and machine are both turned off, operators must remember there may still be pressurized fluid still in the accumulator. This pressure must be bled out, back into the tank, through a dump valve. If this isn’t done, this pressure may still energize the equipment without the operator knowing it. This oversight has claimed the lives of technicians and mechanics. Some accumulators have solenoid dump valves that automatically dump pressure by discharging it into the hydraulic system when the pump or the machinery is turned off. Some dump valves must, however, be manually turned off, and these are the most dangerous. *Everyone who works on such a hydraulic system must know where the bleed valve is, otherwise the whole system may just be an accident waiting to happen. You must never use any compressed air or oxygen with your bladder accumulators as these can stimulate combustion. They can act as an accelerant when mixed with combustible chemicals. Instead, you must use dry nitrogen, since, as an inert gas, isn’t combustible. Most accumulators will spot a sticker that warns operators to only use dry nitrogen gas when pre-charging your bladder accumulator. But even when the accumulator isn’t labeled as such, you must still remember to only use dry nitrogen gas to charge the bladder. It is perhaps wise to assume your pressurized accumulator to be a fully loaded missile. If it isn’t securely fixed to a mount, the poppet valve can disengage. This will blow the accumulator off due to the charged pressure already built up inside. These are dangerous conditions to put people and equipment in. Avoid it by using secure mounts with your accumulators. Just as important, ensure the accumulator is completely bled out before you take the accumulator off the hydraulic system. If you only have one accumulator in service the consequence is also that the accumulator is taken away for re-charging too often than would be ideal. The effect is every time the energized accumulator is transported back and forth of the shop there is a risk the outlet valve can be disturbed. The released pressure will blow off the accumulator and cause accidents and injuries. Take extra care if you have to do this with your accumulator. ● Bladder kits (for accumulator repair). It is also important to use the right tools when repairing your accumulators. In particular, seals on piston accumulators can easily be damaged if the wrong tools are used for piston insertion and seal assembly. Another important component of accumulator installations is nitrogen gas bottles. These are sometimes a part of the accumulator assembly, especially in larger operations where the accumulator needs a more consistent gas supply. Note: We can go up to 15K on pistons. Cylinder Bore: 2” up to 12”. Gas Bottles-No bladder or piston. Cylinder only. We have a new double neck, seamless bottle for this product. This is a new product that would be worth listing. Hydraulic accumulators are mechanical devices used for storing energy. Coming in many sizes and shapes, this engineering essential accepts hydraulic pressure to store it and release it when needed. These devices use a non-compressible hydraulic oil that is held under pressure by means of a raised weight or spring to generate hydraulic energy. We have a hydraulic accumulator for every need, whether you run a small backyard operation or a large industrial plant. Applications for these hydraulic accumulators are many and varied, including use on cranes for loading and unloading goods, on self-closing bus doors, beverage bottling plants, and on many other types of machinery. AI-CG6-6KT-SS Accumulators, Inc Complete Charging and Gauge Assembly with 6,000 PSi Gauge* (Includes..
AI-CG3-6KT-SS Accumulators, Inc. Charging & Gauging Assembly Kit for 3000 PSI Accumulators, 6000..
AI-CG3-3KT-SS Accumulators, Inc. Charging & Gauging Assembly Kit for 3000 PSI Accumulators, 3000..
Ai-2.5-3KT Accumulators Inc Bladder Kit, 2½ Gallon, Buna N, Standard 3,000 PSi Stem, for Top and Bo..
A1QT31003V Accumulators, Inc 3,000 PSi Accumulator, 1 Quart, 1-1/16” SAE Port, Fluoro Bladder, Bot..
A13100 Accumulators, Inc 1 Gallon Accumulator, 3,000 PSi, 1¼” NPT Port, Buna N Bladder, Bottom Re..